It seems no retro-loving, Instagram-worthy home is complete without a Senecio rowleyanus, the stunningly cute succulent vine lovingly known as the string of pearls. But if you’re not renowned for having the greenest of fingers, this faux variety from Debenhams, £28, would look right at home on your bathroom shelf or mantelpiece. Don't miss our house plant display ideas (fake or otherwise) – and if you buy real houseplants, find out how to care for them. This blue peacock fringed cushion, £22 from Dunelm is enough to set the heart of even the most hardened vintage collector fluttering. The teal embroidery and gold fringing make a real statement – just imagine this on your sofa amidst a collection of dark florals and chartreuse cushions. Texture adds interest and depth to any room; and for the vintage home lover anything faux fur is always going to prove a winner. I love the colour of this fluffy ochre cushion cover from Dunelm, £8 – ideal for cuddling up with as the cold nights draw in. Find more lovely cushions in our buyer's guide. A collection of coloured glass vases makes a real statement display – team them together near a window to catch the light or fill them with interesting items such as vintage knitting needles, tapered candles or dried hydrangeas. This teal pressed wide bottle vase is £18 from Dunelm. Find more gorgeous vases in our buyer's guide. Over the years I have collected a whole range of quirky and eccentric ornaments – some from global adventures and others found closer to home in car boot sales – but to me they all tell a story of previous owners and exciting adventures. This gold fish vase, £12.50 from HomeSense, will certainly stand out in any Instagram shelfie. Who doesn’t love a bold wall covering? This toucan design from John Lewis is just so beautiful. The unusual colour way looks likes it has come straight from a stately home – I’d be so happy to style a room around it. Ipanema Heritage blue wallpaper, £35 per roll. Find more statement living room wallpapers in our buyer's guide. One quick glance at my Instagram account and you’ll notice I don’t do bare walls. Almost every inch is covered in paintings – from Vernon Ward to Tretchikoff – with mosaics, plates and bevelled-edge mirrors in between. And the vast majority are floral of some sort or other. This Blossom canvas, £24.99 from Very, would be a great starting point for a gallery wall display set amongst a collection of artwork in varying sizes. Find out how to create the perfect gallery wall from scratch – and check out our gallery wall design ideas. 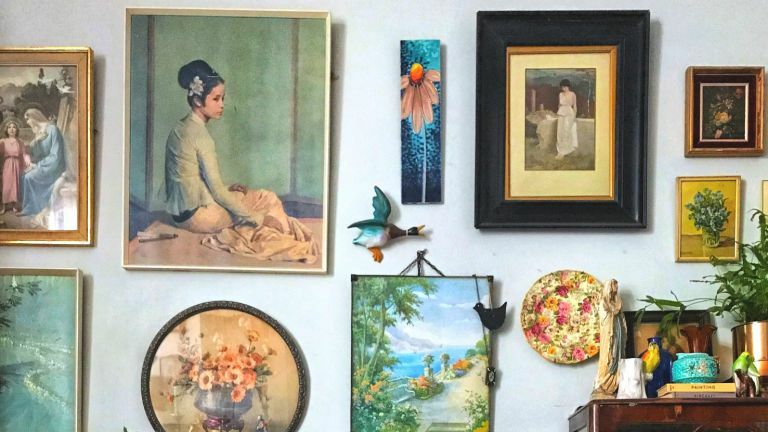 'As someone who’s been obsessed with vintage frippery for more years than I care to remember, I now have a house that is filled to the brim with one-off pieces, car boot treasures and charity shop finds. It’s an eclectic look that’s taken what sometimes feels like forever to create and I have to admit that I’m still constantly on the prowl for yet another vintage cushion, piece of barkcloth, vase or ornament to add to my collection.